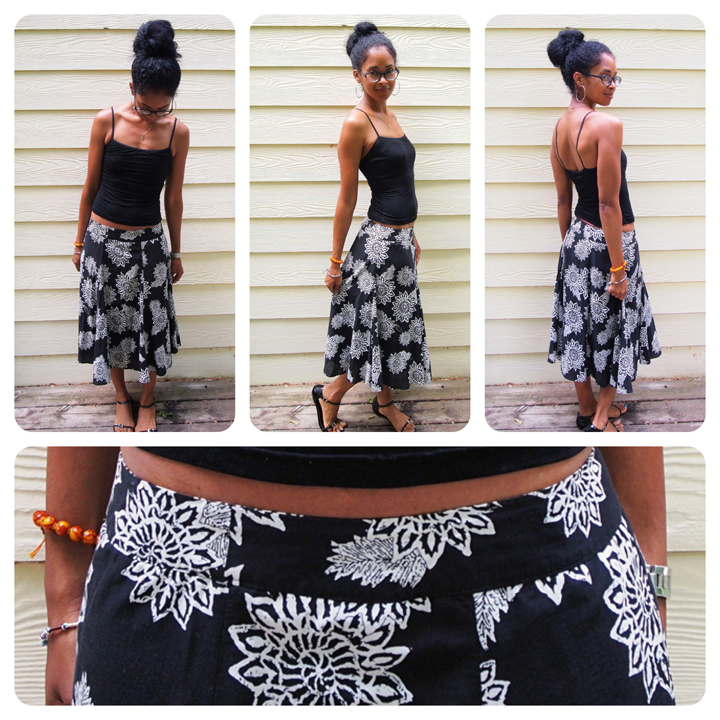 Skirt - NY & Co.
Flowy "gypsy" skirts (sometimes called "circle skirts") are a big staple for me during the spring/summer. I have quite an assortment in several colors/prints and lengths. I think they look so cute and girly and are just so easy to throw on with a tank: an instant, but simple pulled together look with a slight bohemian vibe. Anyway, we both had chimichangas and "grown-up drinks" as our waiter called them. I had a spicy margarita, which is basically a regular margarita made with tequila infused with some type of chile. It was quite delicious, and I liked that hint of spice! Oh, and we got serenaded by a guy on a trumpet. How random. Hope you guys had an enjoyable weekend and are ready to face the week ahead! Candice--yea, I think I like the location and vibe most of all! Anon--I have some "Keep It Tight" posts in the works. Talking more about my diet and workout habits. Stay tuned! I love your friend's hair! And, girl, you are too cute with your slim/fit self. You look fab and love your outfit! I'm with Anon...please share more of your workout secrets and how do you stay so motivated with two kids. Love your blog! What a cute skirt! The length and pattern are perfect. The flats I got from either TJ Maxx or Marshalls a couple years ago. The brand is "Stermax & Co"?